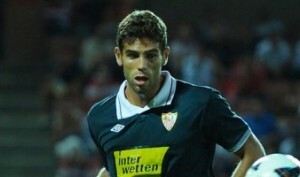 Reports have emerged claiming that Arsenal face Liverpool competition for Sevilla defender Federico Fazio. It is said that Gunners boss Arsene Wenger is having the Argentine watched leading up to the summer market. Liverpool are also interested in the giant stopper, who has made 24 appearances in La Liga for the Andalusian club so far this campaign. Reds boss Brendan Rodgers was linked with a move for the 26-year-old in January, and could revive his interest this summer with Jamie Carragher set to retire and question marks over the long-term future of Martin Skrtel.